How is higher education financed in India? Within the economics literature, education is considered to be one of the classic public goods (Grace, 1989). Public good is a good where benefits of engaging in the activity are accrued not just to the individual, but to society at large and thus is susceptible to under/over provision. For example, an informed and educated citizenry can engage more ably in the democratic process, ultimately leading to a more effective government. Unfortunately, only some of this benefit is accrued to the individual. Left to their own devices, individuals would systematically underinvest in this activity from the perspective of greater society, ultimately leading to worse outcomes for all. 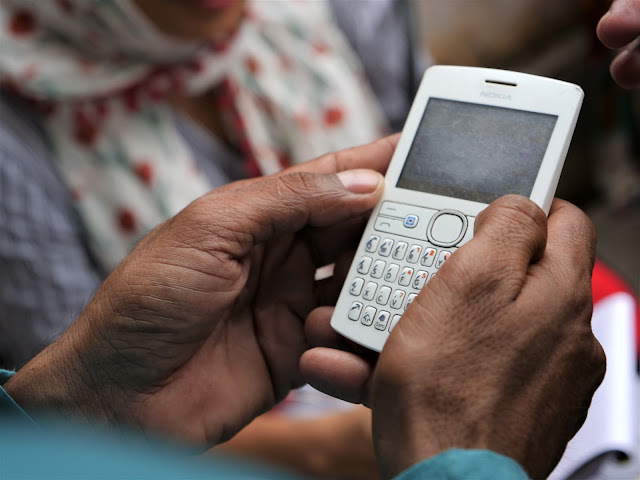 In a situation where the market-based solution is essentially guaranteed to deliver an inefficient allocation of resources, it is unsurprising that the central Government of India (GOI) considers education to be one of the country’s key priority sectors. As a result, the GOI has spent a significant amount of time, money and effort in developing this sector in terms of good quality of education, teachers, institutions, and infrastructure. While elementary and secondary education in India is largely government-financed, the same is not true in higher education, as we see a large number of private stakeholders. Although, public private partnerships have the potential to bring efficiency and healthy competition, an increased private (for profit) sector presence in higher education could be problematic. 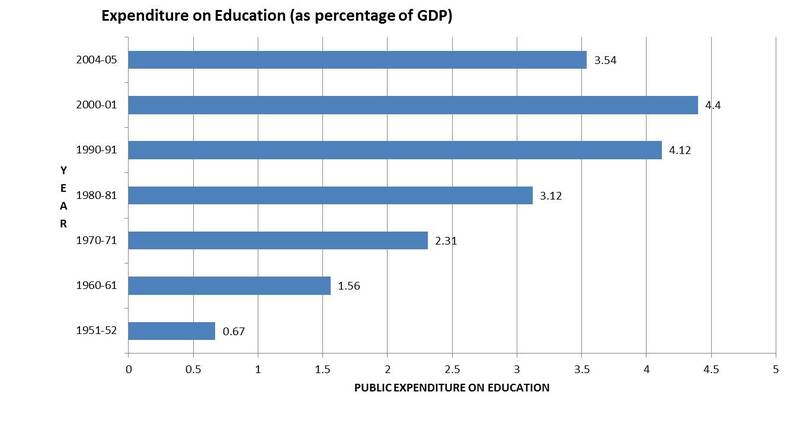 Over the last five years, public expenditure on education sector has been increasing. 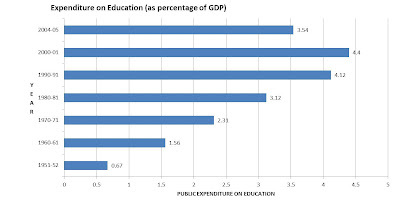 However, 2004-05 saw a decline in the percentage of GDP spent in the education sector, largely due to the increased share of private (for profit) sector spending in higher education. Although a recent look at the financial budget 2012 highlights an 18% hike in allocation of resources towards education sector, the actual student share in allocation of these resources has hardly varied. This is visible in the fact that Government has adopted a ‘top-heavy approach’ in allocating resources in the education sector by spending an amount close to 150 crores in building new branches of already existing central institutions. In fact, the amount of scholarships provided by GOI as a percentage to total expenditure in higher education has also declined from 62% in 1990-91 to 24% in 2004-05 and caters to only a very small percentage of the low/middle- class family. The above graph shows that the share of public sector in higher education has come down from 54.7% to a mere 37%. This increase in share of private sector provision of higher education is largely due to the courses offered by them in management, engineering and medical sciences at tuition fees typically five times that of a comparable public institution. These courses are mostly self-financed by the students either through funds from their family or by acquiring education loans from banks. The trends in financing higher education globally are no different. The decline in government expenditure on higher education is not just restricted to developing countries, but a similar trend has also been observed in developed countries. The GOI has reduced its responsibility of financing higher education in forms of hiking tuition fees, introducing user charges (charge for various services within the University), attracting foreign students to University, so that much higher fees can be charged from such students to subsidise the cost for the local students, etc. A good number of countries provided higher education for free, however now the list of such countries has reduced to only a few countries (Brazil, Sri Lanka, Tanzania, and some European countries). Increased dependency on private sector in higher education, lack of scholarships, and reduced public expenditure (as a % of GDP) over the last few years, indicate that GOI is inclined towards shedding its responsibility to fund higher education. Given its status as a public good and as a core sector of the Indian economy, shifting the provision of education, and its associated costs to the private sector and onto individuals actually risks the under provision of education to those that need it the most. In my next blog post, I will talk about the problems with financing higher education in India and implications of lack of public expenditure in the education sector. Hey I just wanted to say that I really enjoyed reading your blog. You have good views, Keep up the good informative info.Good Quality and very informative Blog! Sashakta Technologies Private Limited has Partnered with SAP AG, Germany And has Opened a world class SAP Authorized Education Center in Jaipur, Rajasthan. I think that this programs that was being implemented in India could really give some good advantage to the Indian student's to learned very well in higher education. Good thing that the result of the GOI program leads into this kind of school programs in India. Psychology is defined as the study of mental functions and behaviors; however the ultimate goal is to understand individuals and groups by establishing principles of generalization through research. over here Psychologists are able to explore and establish these principles by perception and interaction. Creo que estos programas que se están ejecutando en la India podrían realmente dar una buena ventaja es que aprendió muy bien en la educación superior el estudiante indio. Lo bueno es que el resultado del programa de Gobierno de la India lleva a este tipo de programas de la escuela en la India. The ratio of higher education represents the ratio of development in a country. According to my suggestion every country should take special measures to cut down the fees and costs of high education so that maximum people can get education. You are presenting the statistics of India which is showing development in this sector. The Personal Statement Champaign-Urbana, Ill. is always encouraging students to make their presentation batter by getting their services. Informative post with good and deep insights, I totally consents with you.